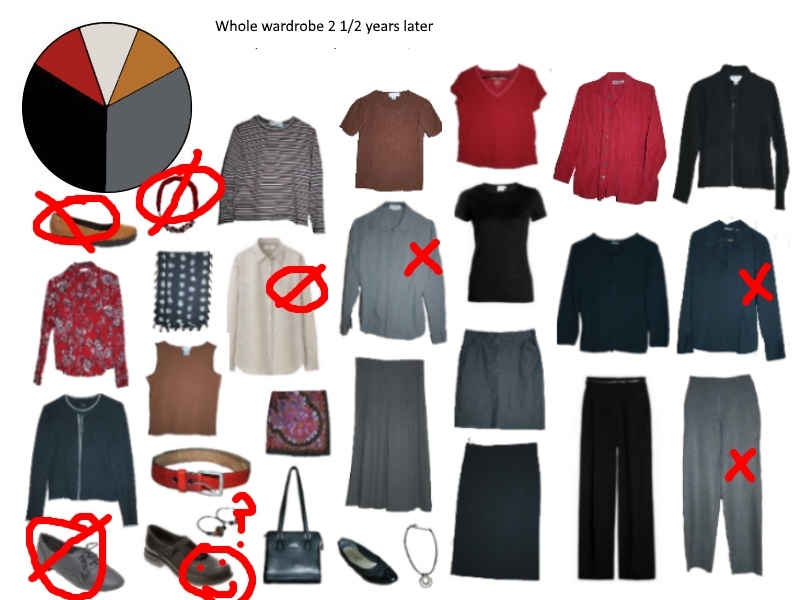 Well, it seems that I never did do my second blog post on my from scratch wardrobe. Never did really do much with this blog either. 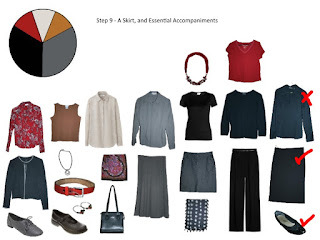 I am still interested in capsule wardrobes and it seems so is the whole fashion community on the internet. 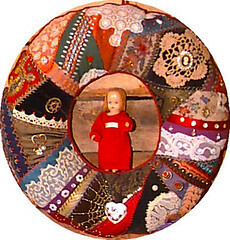 I was reminded of this wardrobe by Janice's newest post on The Vivienne Files. She takes six scarves and builds wardrobes based on them by choosing a new outfit per month. The first scarf has the same colors as this wardrobe of mine with the exception of the red. I'm still wearing most of the clothes and still loving the colors. So here is the completion of the wardrobe that I did back when I did my first post on it and some updated thoughts about the wardrobe. I left off with Step 9. I added a black pencil skirt. For me this is a true essential. I gained enough weight last summer that I needed to replace my two black pencil skirts. When I need clothes I turn to the thrift stores first. I was having no luck at all until I went to a Goodwill in another town. Score. I bought three different black pencil skirts and also a long black linen one. The clerk just shook his head at my pile of black. I was thrilled. So far I've worn the heck out of two of the pencil skirts and the linen one. Back to step 10, I added the black blouse that has a big X on it because I donated it. I have issues with wearing woven blouses. I replaced it with a nice black linen short sleeved blouse that I wear only a little more than the other one. I still have the shoes, but never wear them. They just aren't comfortable enough. In step 10 I added my black boiled wool jacket. This continues to be my favorite medium weight jacket. I also added a striped t-shirt that has many of the wardrobe colors. This gets worn quite a bit. The shoes were one of my needs that never got purchased. What I wear instead are my cognac Maryjanes. 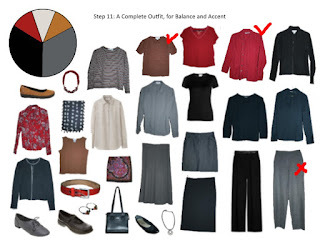 Step 11 got grey pants that have since been donated a red silk shirt that I love, wore yesterday to church with my black pencil skirt in fact, and a cognac sweater that I'm still fond of. A lot has changed since I put this wardrobe plan together. The main change was that I retired the next spring. I went through a big adjustment wardrobe-wise and I'm still adjusting. I had closets and dressers full of clothes that I was wearing mostly to church and not much at all that I was wearing on a daily basis. I finally just got over it and started wearing my most comfortable skirts and tops at home. 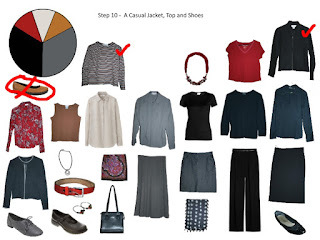 The grey skirt has been worn constantly in the cooler months. So, how did the plan pan out? The main action I took was that I bought a great pair of black Maryjanes almost exactly like the ones I put in the plan. I never did buy the necklace, but would still love to have something similar. I never found a pair of grey oxford shoes. The cognac ones I just really didn't like enough to buy. I realized that I am very picky about woven shirts. I never bought a white one and got rid of the two I did have. I'd love to find a nice pair of grey pants, maybe wool to replace the ones I never really liked. The rest of the clothes are still being worn. In fact I've worn the cognac tank and red tshirt so much they both need to be replaced. I lost the earrings. The weight gain made me size out of the red belt. But hey, that's what New Year's resolutions are for, isn't it?